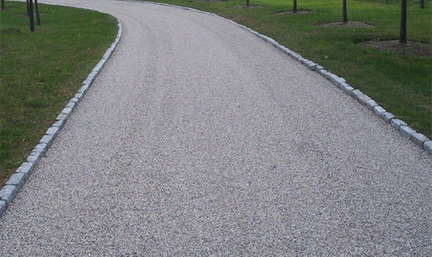 Although it is similar to a traditional asphalt driveway, Tar and Chip driveways utilize a different technique in order to achieve a less expensive surface that is still paved and durable. When creating a traditional asphalt surface, contents are mixed beforehand at a plant and then delivered to a job site. On the other hand, Tar and Chip surfaces are mixed at the job site instead of at the plant. With this method, there are three steps. First, hot tar is poured on the ground. Second, bits and pieces of stone are laid on top. Third, a heavy roller vehicle drives over the surface and compacts the pieces into the tar adhesive and smoothes the surface of the new pavement. This method, Tar and Chip, is very cost-effective and offer some ways to customize your project. Since the contents are mixed on site, you are allowed to choose different colors for paving projects, depending on what materials are available for the mixture. Tar and Chip driveways are a great alternative to regular asphalt pouring. It is cheaper and requires less maintenance. Hero Paving can assist you in making a decision about what is best for your paving project!